Storing your valued wine collection should be enjoyable and hassle free, it shouldn’t become a chore! This isn’t always the case however when you have what seems like an endless amount of bottles. Whether it’s a small collection which is kept within a single rack, or a whole room which is filled with wine, our range of wine rack and cellar accessories will help maintain and improve how you manage your collection of wine. Wineware stock a whole host of accessories that are suited to enhancing your wine rack or wine cellar. Our main focus is on protecting the wine that you’re storing within your rack, whether it’s the bottle itself or the wine label. It’s also vitally important to easily identify which bottle of wine it is that you’re looking for and which part of the rack or area to which you can add additional bottles. Wineware has some brilliant ways to protect wine when it’s stored within a wine rack. The cost effective netted wine bottle protector sleeves is one way. These white polypropylene sleeves simply slot over the top of the bottle and sit at the widest point, vitally covering the wines label. They easily stretch and are very flexible so they fit most shaped and sized bottles which you choose to protect in this manner. 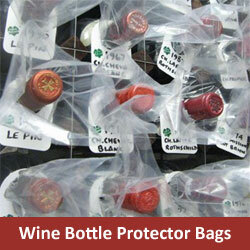 Secondly, Wineware’s very own plastic wine bottle protector bags. These see-through plastic ‘bags’ keeps your bottle and more importantly the wines label fully protected from any dust, dampness, spills and leakages. A large majority of a wines value is from a pristine and un-harmed label which clearly signals which wine it is. It’s important that this is fully protected and ‘un-touched’ if you’re looking to possibly sell your wine one day. Even if you’re not looking to sell, just having a clean, pristine label on the bottle to enhance your dining table and impress your guests/customers makes all the difference! To protect your bottles to the fullest when stored within a rack, we highly recommend that you use either or both of these cost effective and simple solutions at the same time. If you have a large collection of different wines, trying to find the bottle you’re looking for can sometimes be a bit of a struggle. 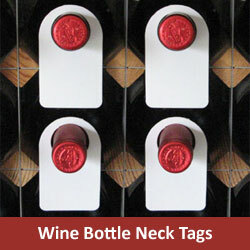 Using the simple and cost effective solution of wine bottle neck tags will help when looking for that special bottle to serve with your dinner. We stock a varied range of bottle neck tags, in different pack quantities and in different materials, eg paper, plastic or card. The card bottle neck tags are totally re-usable depending on the writing implement used, so once you’ve withdrawn a bottle, enjoyed the wine, you can re-use the tag! With large wine collections, recording where you have certain bottles, like the type of wine, the vintage or the area in the World it’s from is a good way to store your wine. Writing and keeping a note of where in the rack or the room you have your bottles is the best way to successfully identify and locate your wine. 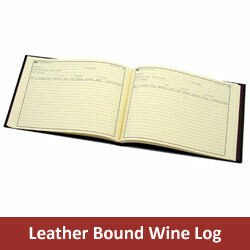 Use our leather bound wine log to record where you’ve stored your bottles. A popular method is a bit like the game ‘battleships’. Each ‘hole’ within the rack has a different outcome, so using the formula of columns and rows is highly recommended. When storing wine, it’s important that the area / space doesn’t exceed 75% humidity. Wine needs to be stored at this level so that wines with traditional corks don’t dry out. If the cork does being to dry out, it can allow oxygen to infiltrate into the bottle, filling the ‘empty’ space and tarnishing the wine. Keeping an eye on the humidity levels is vital, so why not use our very own, easy to use and read, Thermohygrometer. This wonderful instrument displays both the temperature and humidity at the same time and has the facility to show where the temperature or humidity has been, both highs and lows, since the last time you checked. 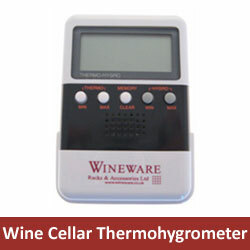 Click here for more information regarding wine rack and wine cellar accessories.